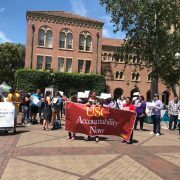 USC Forward — a coalition of students, South Los Angeles residents and community leaders — began demonstrating along Jefferson Boulevard Saturday to demand accountability and transparency from the University. Organizers set up “Tent City,” a group of 10 tents representing homelessness and the impact of gentrification in the surrounding community, outside of the University Park Campus gates. 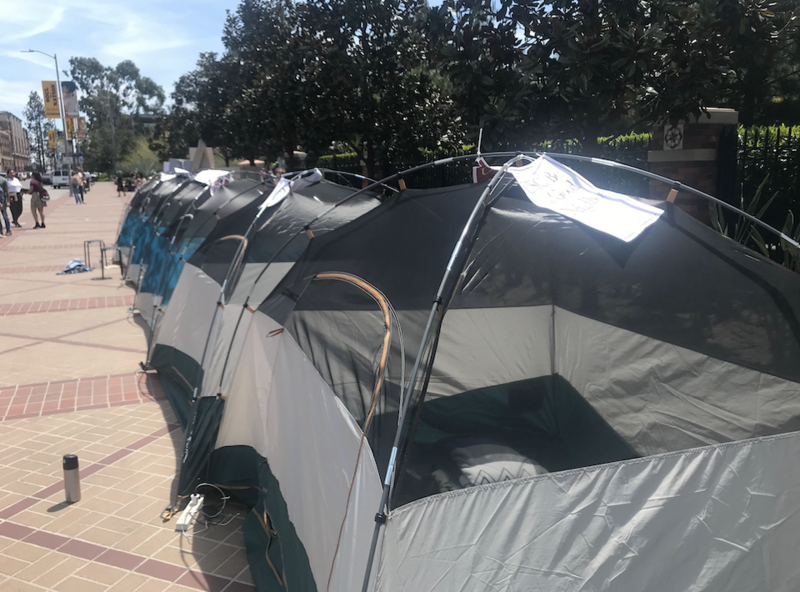 Amid the Los Angeles Times Festival of Books, which brought thousands of people to campus throughout the weekend, demonstrators began camping out 24/7 on Saturday. They plan to continue the demonstration throughout the week. The coalition — a project of Service Employees International Union 721 — partnered with the Alliance of Californians for Community Evictions, Clergy & Laity United for Economic Justice, the Alliance of Californians for Community Empowerment, the LA Tenants Union and the Southern Christian Leadership Conference. According to Department of Public Safety Assistant Chief David Carlisle, the SEIU secured a permit from the city of Los Angeles to create “Tent City” along Jefferson Boulevard. Valdez said that SEIU has tried working and meeting with USC for over three years to create labor unions for University faculty; however, the school refused to budge. 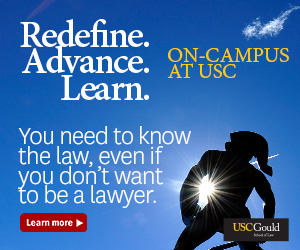 In a recent case involving full- and part-time non-tenure track faculty at the Roski School of Art and Design, the U.S. Court of Appeals disagreed with some of the language used in past court rulings on labor unions at universities and made it easier for employees to be considered managers who would be ineligible to unionize. Valdez said that USC could find a way to create shared governance within a union, but it does not want to relinquish its control over faculty decisions and issues. 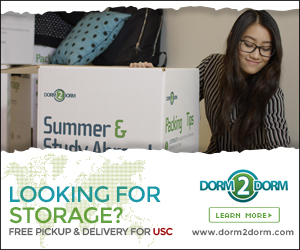 “This is about power and control and greed for USC, and they’re not willing to share that with their students who supposedly they’re building to be leaders in this world,” Valdez said. The coalition delivered a letter of the organization’s demands to President-elect Carol Folt’s office. In the letter, which was obtained by the Daily Trojan, the organization called for accessibility for low-income students, affordable housing, community benefits, campus safety and labor rights for faculty, staff and students. 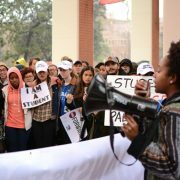 During Sunday’s demonstration, organizers held a listening session for attendees to voice their grievances with the University. 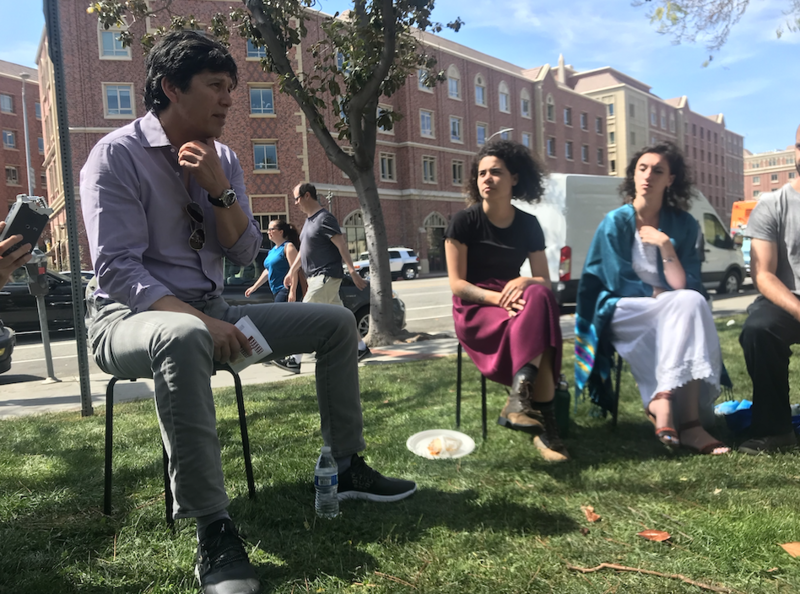 Former California Senate Pro Tempore Kevin de León sat down with attendees to discuss the importance of community engagement and commitment. ACCE co-director Joe Delgado is currently staying in one of the tents along Jefferson Boulevard to protest gentrification and evictions in the surrounding area caused by developments made by the University. 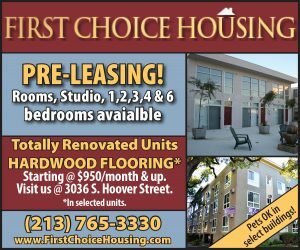 Residents on Flower Drive and Exposition Boulevard have faced evictions as a result of expansions in student housing. He said that local residents are being pushed out of their homes by companies that want to create more opportunities for off-campus student housing options, so they can charge higher rates. A member of ACCE who goes by “Karin” discussed the problem of rising rents and gentrification, which she attributes to the creation of USC Village and the rising cost of student housing in the neighborhood. Karin, who lives in the city’s 9th Council District, said her landlord has tried to evict her four times in order to charge future tenants higher rent. Karin also discussed the importance of USC reaching out to students in neighboring schools and promoting equal access to affordable higher education. De León said USC must work with community leaders and local high school students to ensure equal access to resources. Shany Ebadi, a junior majoring in political science who attended USC Forward’s press conference Saturday, said she has been working with the organization since last fall with a focus on the intersectionality of issues related to sexual assault and student safety. Ebadi said she hopes the University will listen to the demands of the coalition and work to increase accountability among students and the community. “They are sleeping on the streets for five nights to ensure that their message is being heard and demanding the administration to be held accountable and listen to these stories,” Ebadi said.